If you’re tired of toiling over each wine bottle to try to get it open while your guests sit and wait with empty glasses, it’s time to pick up an electric wine bottle opener. An electric wine opener takes just seconds to remove the cork. It’ll save you time and effort, and will impress your dinner guests who will have their glasses filled in no time. It’s perfect for those with arthritis as well as those who simply have trouble using traditional corkscrews or don’t know how to use them. 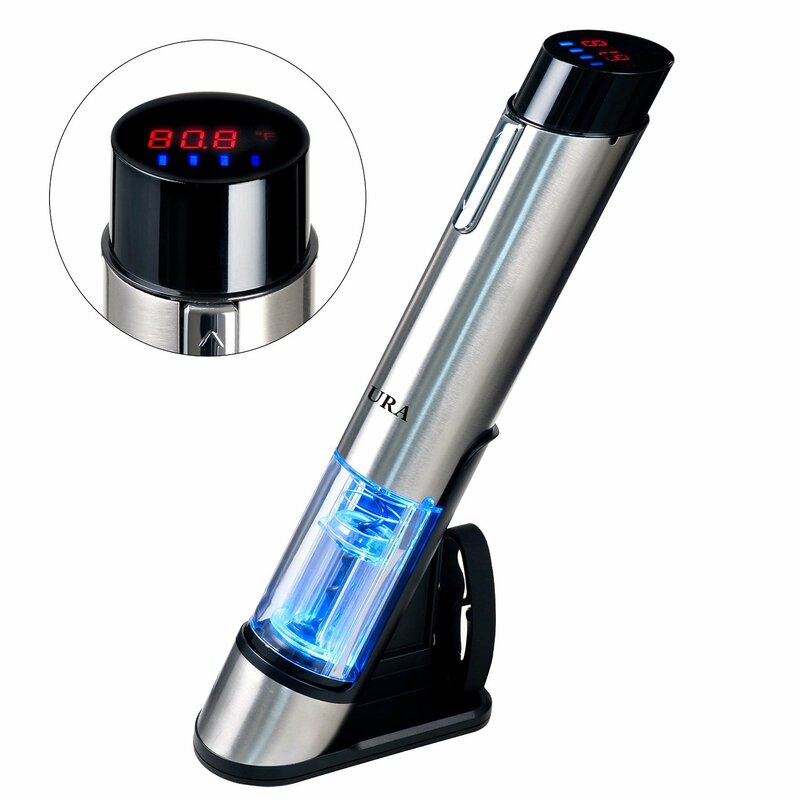 When choosing the best electric wine opener, you’ll want to find one that will work great and last a long time. This list will help narrow down your options. Here are the top five electric bottle openers on the market today. The Oster wine bottle opener is cordless and portable. On a single charge, it can open as many as 30 wine bottles. You don’t need to keep it on the charging stand, as it will hold a charge for many weeks. So if counter space is of concern, you can charge it up and stow it away in a drawer until you’re ready to use it. It takes just a few short seconds to completely remove a cork. Simply hold the button on the top again to make the cork pop out once it’s inside the bottle opener already. It works great with any traditional bottles and removes rubber or traditional corks just the same. It includes a foil cutter as well for making it that much easier to get your wine ready to serve. The Oster wine bottle opener costs around $15 and comes in silver or black & silver. This electric wine bottle opener features a curved European-style design that allows it to stay upright on your countertop without a stand. The charging cord plugs directly into the bottle opener. Its easily removable lid doubles as a foil cutter. With a single charge, it can open up to 40 wine bottles. It is transparent, allowing you to watch the entire process of cork removal. When the bottle opener is in use and while charging, a blue LED comes on. 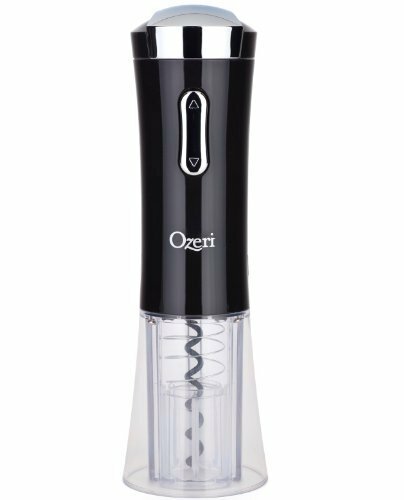 The Ozeri opener is cordless, portable and entertaining to watch. It makes a great gift for any friend or family member who has a taste for wine. It comes in black, red or silver and only costs around $13. This durable, long-lasting opener offers great value for its price. Secura’s electric wine opener features a classy stainless steel body. Its transparent bottom is lit up by a blue LED light. You can watch it in action as it pops out your cork in a matter of a few seconds. The included foil cutter sits neatly beside the wine opener on the stand. To use it, simply place the foil cutter around the top of the bottle and rotate. No matter what kind of cork, the Secura wine opener can open as many as 30 wine bottles from one full charge of its built-in battery. Secura also makes a similar model that features an S.S. thermometer for around $20 more. Secura’s stainless steel costs approximately $25 and comes in one style. The Waring Pro WO50B has a rubberized handle for superior grip during use. Though it opens bottles pretty effortlessly, the added grip helps prevent it from slipping out of your hand. It has a sleek stainless steel end that provides a look of quality and an assurance of durability. It comes with a freestanding charging base that houses a handy foil cutter in the front. The charging base is also stainless steel and black, matching the classy look of the wine opener. With one complete charge, the Waring Pro can open up to 80 wine bottles. It removes any kind of cork in just seconds and comes with a convenient vacuum seal function. This wine opener costs roughly $32 and includes a five-year warranty. This attractive wine bottle opener opens bottles of any size in just a few seconds. It has a durable construction of polycarbonate metal and nylon, and will surely stand the test of time. Its ergonomic handle supports your hand during opening. It comes with an extra worm for easy replacing, and a separate foil cutter. Its unique design will draw the attention of your guests who will want to try it, which will inevitably lead to sharing a glass of wine together and bonding through conversation. 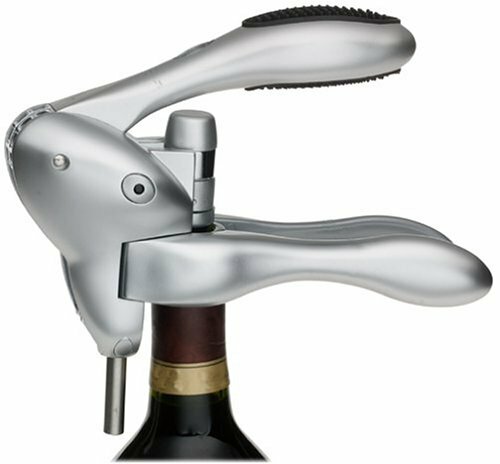 The Rabbit corkscrew comes in silver, black, and red. It costs around $30 and is guaranteed by a 10-year warranty.